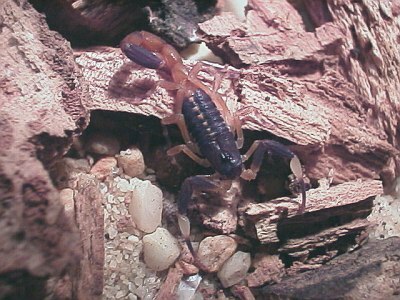 Today I took a few pictures of some scorpions and a tarantula (B. vagans, Mexican Red-Rump). I started with the Centruroides flavopictus since I noticed it was grooming itself after quite a heavy meal that it started yesterday: a cockroach. 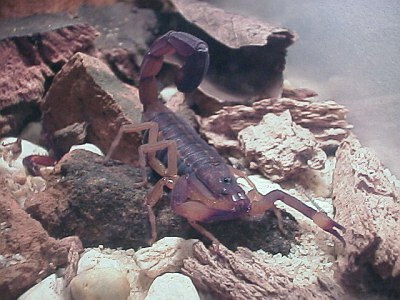 On the above picture the scorpion has one chela (claw) in its "mouth". It makes the chela wet and then strokes itself. 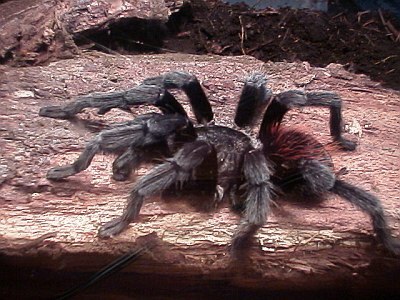 Brachypelma vagans, Mexican Red-Rump tarantula. Next, I took a few pictures of the big tarantula that arrived here last Saturday. It's a beautiful spider with nice red hairs on its abdomen, hence the name (Mexican) Red-Rump. Finally, I took a few close ups of the Centruroides flavopictus I found on the roof of our apartment, the first of July. It molted last week, so it's now 3rd instar. 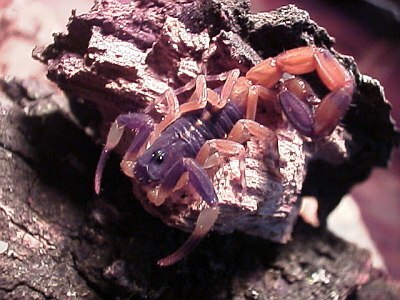 This juvenile scorpion has wonderful colors. Sadly they fade away when it gets older.